This flight review is a continuation of my Singapore Airlines Premium Economy Class review from Singapore to Los Angeles via Tokyo. The first installment of this trip report covered the Singapore to Tokyo flight segment and this installment will cover the Tokyo to Los Angeles flight segment. Click here to read my Singapore Airlines Premium Economy Class flight review from Singapore to Tokyo Narita. At approximately 6:30 PM, I left the ANA Lounge and walked over to the departure gate where my bird was waiting. Boarding was well underway and I just jumped in line with the other economy class passengers. Premium economy class passengers do get priority boarding but it’s only ahead of the economy class passengers. On the ground, Singapore Airlines Premium Economy Class passengers are entitled to priority check-in, boarding and baggage handling. In the air, premium economy class passengers get a dedicated cabin just aft of the business class galley with spacious recliner seats, noise-cancelling headphones, “Book the Cook” meal services and amenity kits. On their Boeing 777-300ERs, premium economy class seats measure 19.5 inches in width, 38 inches in pitch and have 8 inches of recline. The cabin is configured with 28 seats in a 2 x 4 x 2 layout. 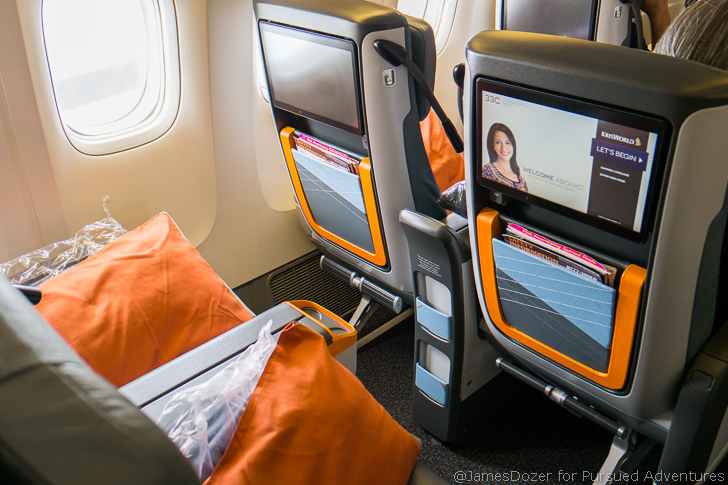 All premium economy class seats are outfitted with both leg rests and foot rests for your comfort. The foot rests are height adjustable and the leg rests do a fantastic job of supporting and elevating your legs during flight. On bulkhead and emergency exit row seats, the foot rests are built into the leg rests. There are plenty of storage spaces at the seat for all of your personal effects including the two-tier seatback pocket and the small pockets to the side and in front of you. Each seat is equipped with two USB ports, one universal electrical outlet (down by the leg rest), two personal reading lamps and a coat hook. Unfortunately, there are no air vents for personal temperature control. WiFi is provided but it is ridiculously priced at $20 per 50 MB of data. Manual seat controls and the IFE entertainment remote are located down by your hips. Here’s the economy class cabin aft of the premium economy class cabin. Unlike the new 10-across trend, Singapore Airlines Economy Class seats are still configured in a 3 x 3 x 3 layout. Seats are super comfortable and provide an industry-leading 19 inches of width and 32 inches of pitch. Each seat is also equipped with an adjustable headrest, personal in-flight entertainment system, USB port and universal electrical outlet. Waiting at our seats were a pillow, upgraded blanket, menu and a set of Phitek branded noise-cancelling headphones. As I settled into my seat, the flight attendants came by with an amenity kit, pre-departure beverage and hot towel and verified my “Book the Cook” meal selection. On longer flights, premium economy class passengers are provided with a very simple amenity kit. On this trip, my flight from Singapore to Tokyo did not receive an amenity kit but my Tokyo to Los Angeles flight did. The top zip case comes with a pair of socks and a dental hygiene kit. I feel like this is an area where Singapore Airlines really could improve upon. The case is nothing special and the pair of socks is the only useful item included as dental hygiene kits are already provided in the economy class lavatories for all passengers. It feels a little half-assed as Singapore Airlines is only providing an amenity kit because the other airlines are doing it, not because they really want to. As a point of comparison, here’s what Lufthansa’s Premium Economy Class amenity kit looks like. Once all the passengers were boarded, the Captain came on the PA to welcome us on board. He provided us with our anticipated flight path, travel time and expected turbulence. We then taxied to the runway and made our journey to Los Angeles. The premium economy class cabin is located directly over the gigantic wings. This flight felt like a completely different flight from my first leg because the flight crew and passengers were all different. There were a few passengers continuing on from Singapore but this flight was not as packed as the first leg. The whole plane was probably a little more than half full with passengers sparsely spread out throughout the cabins. Unlike on my last leg, this crew was a lot more attentive and proactive with service. Once we hit our cruising altitude and the seatbelt signs were turned off, the crew prepared for our dinner service right away. Service started with a pre-meal drink and a package of nuts. Here’s the drink and meal menu. Alcoholic drinks including champagne, wines, spirits and beers are provided complimentary. Because I had “booked the cook” and pre-selected my meal, my food tray came out pretty quickly. As I stated before in my first post, this was a great benefit to eat first and get my meal out of the way (so I could get started on work) but I did have to wait for the beverage cart with everyone else. Luckily, each food tray does come with a small container of water. Dinner was followed by a Haagen-Dazs ice cream and a coffee/tea service. After dinner, all the window shades were asked to be closed and the lights were turned off. For entertainment, premium economy class seats are equipped with a large 13.3 HD in-flight entertainment monitor and a good selection of new Hollywood movies, TV shows, video games and audio entertainment. The IFE monitor is beautiful; it’s crisp, clear and viewable even in complete daylight. If you love Chinese or Indian Bollywood cinema, you will not run out of entertainment. Premium economy and economy class passengers share the same set of lavatories. The lavatories are standard size but are furnished with generic comfort products such as lotion, eau de toilette spray, mouthwash, combs and dental hygiene kits. After dinner, I settled in a for a couple of movies and worked for a bit on my laptop. After a few hours, I reclined my seat back all the way and fell asleep. I was really impressed with the deep recline of the seat and was able to get a few hours of uninterrupted sleep. The seat was soft and comfortable and the adjustable head rest cradled my head just perfectly. The combination of the leg rest and foot rest was great in elevating and supporting my legs. It’s no business class by any means but this was not a bad way to fly. Sandwiches and other snacks were provided in the galleys and the flight attendants did a great job of walking the cabin mid-flight to hand out water bottles. About 2.5 hours before our arrival into Los Angeles, the cabin lights were turned on and the flight attendants prepared for our pre-arrival meal. Our meal was served all one tray. I only have one other premium economy experience to compare this to but I would rank Singapore Airlines Premium Economy Class above my recent Lufthansa Premium Economy Class experience. I think the seat, services and amenities provided on the ground and on-board greatly outweigh Lufthansa’s Premium Economy overall product. 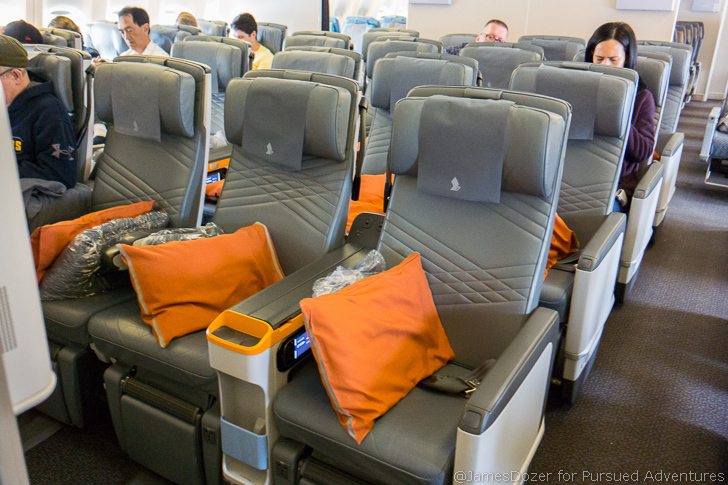 Lufthansa Premium Economy Class feels closer to an economy class product whereas Singapore Airlines Premium Economy Class fits exactly where it should be, squarely in between their economy and business class products. Overall, I was impressed with Singapore Airlines Premium Economy Class and I would definitely pay a premium to book premium economy over economy class. The seats are extremely comfortable and the amenities and services afforded to premium economy passengers make the entire experience more pleasant and enjoyable. Singapore Airlines Premium Economy Class is a great product and will surely be a hit with passengers. 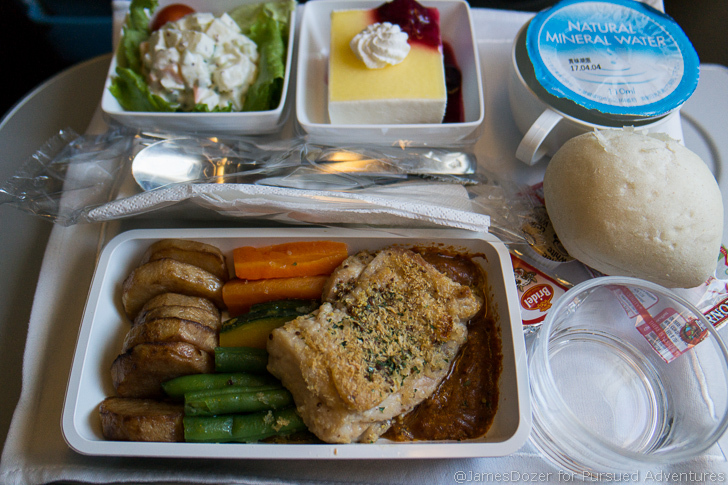 So what do you guys think of Singapore Airlines’ Premium Economy Class product? Worth the upcharge from economy class prices? Please share your thoughts with me in the comments section below. Thanks for reading!